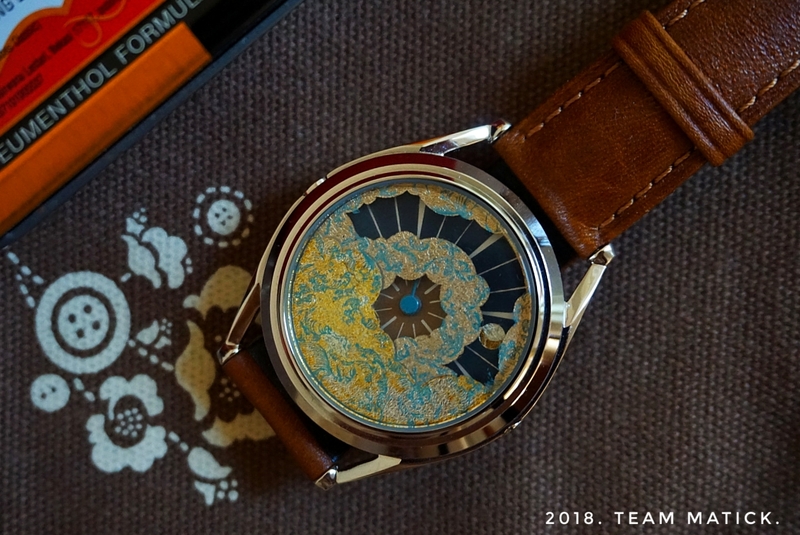 Never would I have thought that there would be a time where the art of watchmaking and the fabled gilding technique would come together as a unified whole. Case in point, the Nuage by Mr Jones Watches embodies exactly the spirit and synergy of that seemingly unlikely union. 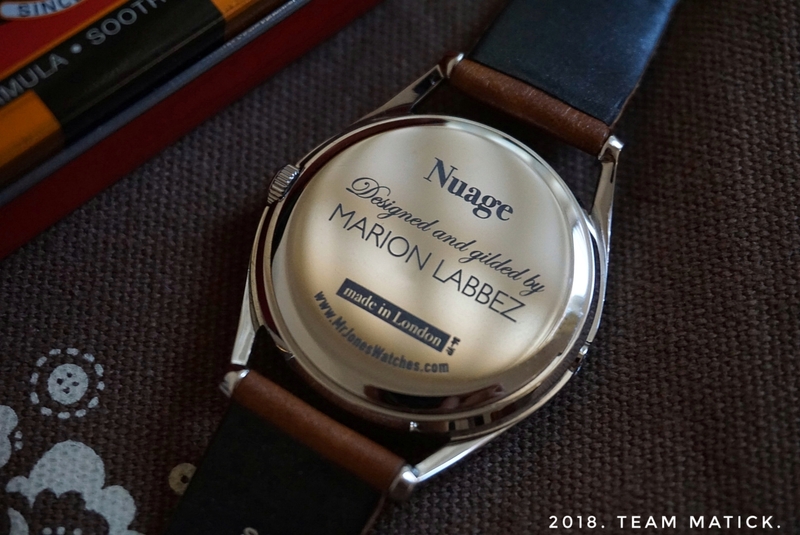 For those not versed in French, the name ‘Nuage’ means ‘clouds’, which tells the story of the artisan behind the creation of the watch, Ms Marion Labbez. The term ‘gilding’ refers to a number of traditional methods used in decorative work, by applying fine gold leaf or powder to solid surfaces such as wood, metal or stone. In the case of the Nuage, a thin coating of gold is to be found on its crystal. Needless to say, gilding is an intensely laborious process, and to create something like the Nuage requires no less than the highest levels of artisanal skill and patience. The Nuage as seen on Maxine’s wrist. What can I say? The Nuage is by far one of the most elegant and beautiful watches I have had the pleasure of wearing. Dreamy to gaze upon, it is a true masterpiece and is easily one of my favourite creations coming off from the MJW workbench, the reasons for which I will explain in the following passages. Aside from being one of the most elegant pieces in my collection, at 38mm wide, the Nuage is also one of the most diminutive. As of late, I have also found myself leaning towards more modestly sized watches, as they provide me with refreshing contrast to my more contemporarily-sized watches; my Dietrich OTs come to mind. … the collaborative spirit between MJW and extremely talented artisans, such as Marion Labbez, transcends gender-specific design fixations. I think the appropriate adjective to describe the Nuage’s overall design is ‘majestic’, and perhaps even avant-garde to a degree. The sense of elegance portrayed is one of a conscious effort, and in a way, the Nuage feels like a watch from a different realm. It is one of those watches which pique your curiosity when you see it on someone else’s wrist, and if you’re a shamelesss watch geek such as myself, you would then swiftly proceed to ask for a closer look. It is difficult for me to express in words how I felt when I first saw the Nuage in the flesh, but I suppose ‘breathtakingly beautiful’ would not be too far off. A quick visit to the MJW website reveals that the Nuage was designed to be a companion piece to the no less wonderful Chinoiserie and Ka 火. Observably, all three watches share a familial design DNA. For me though, and once again, MJW has knocked it out of the park with the Nuage. The star of the show here is with little doubt the exquisite gilding by Verre Églomisé (the process of applying both a design and gilding onto the rear face of glass to produce a mirror finish) artist Marion Labbez, whom is one of only a handful of Verre Églomisé specialists working in the UK. Marion is also the artisan behind the Chinoiserie and the Ka 火.
Marion has meticulously put together a beautiful landscape depicting clouds shrouding a clear blue sky. The clouds are made from 22-carat gold and silver palladium leaf, whilst the blue sky is crafted from tempered carbon steel, which transforms into a rich blue tone when heated to scorching temperatures of about 300 degrees Celsius. Finally, because every Nuage is hand-painted by Marrion Labbez herself, every piece is one of a kind, differing ever so slightly from the next. Powering the Nuage is a humble Swiss Ronda Quartz 515-24H. Truth be told, the unconventional method of reading time on the Nuage did not surprise me one bit, but that came along with the understanding that such a way of doing things is MJW’s charm and goes to their very identity. Telling the time on the Nuage may seem like a complicated task, but it really isn’t too different from the Sun & Moon watch, should one be familiar with it. One simply tracks the hour by observing the position of the sun/moon in the sky. The opening crescent of the sky represents 12 hours (am/pm interchangeable) in a day starting from left to right (6am to 6pm then to 6am again). As the sun rises from the 6 am position at the left, it would eventually set at the 6pm position on the right, and as it sets, the moon would rise from the left and the cycle continues until 6am on the right. Midday – 12am/pm would be represented when the sun/moon arrives at the centre position of the crescent. As for the minutes, one simply reads it the usual way at the centre of the dial. Got it? No? Me neither. Don’t worry, for time-telling is probably one of the last things you would care to do on a watch as gorgeous as this. Not to be outshone, the Nuage is complemented by a beautiful tanned leather strap made by Hirsch, which is a perfect match for the dial’s earthy tones. Those of you who are strap geeks like us will know that Hirsch is renowned for the quality and comfort of their straps. Those virtues are to be found here as well, as the Nuage’s strap was supple and soft to the touch. I simply cannot think of a more elegant choice of strap for the Nuage. Given its relatively modest proportions, bright colours and intricate design, you won’t be faulted for thinking that the Nuage is a watch that leans towards the feminine end along the gender continuum. But in a world of watches where most makers prioritise designing watches for men over women, it takes a certain level of confidence for a young male, such as myself, to wear a watch like the Nuage. Regardless, I am more than willing to be seen with the Nuage out and about. There are only very few feminine-esque watches in my book which I am willing to wear without hesitation, and the Nuage is one of them. Although I may be inadvertently conveying the impression that the Nuage is a watch meant only for ladies’ wrists, one has to realise that MJW has always produced small watches relative to the modern norm, which I believe is a conscious effort on their part to preserve and highlight the nimbleness and intricacies of each handcrafted piece. Controversially, MJW is to me a brand which can be placed amongst the likes of Faberge (have a look at the Lady Compliquée Peacock) – watchmakers which make me fall head over heels for even their most feminine pieces. In the case of the Nuage, and many of MJW’s other offerings, the collaborative spirit between MJW and extremely talented artisans, such as Marion Labbez, transcends gender-specific design fixations. Other brands could take a page (or several) out of MJW’s book in this regard. On a lighter note, the elegance articulated by the Nuage is not by any means overbearing. The Nuage has a somewhat preppy aesthetic, whilst effortlessly maintaining its mysterious demeanour, thanks to its unconventional way of time-telling. Although I do not consider myself the kind of guy who ‘dappers’ himself up all the time (more of a T-shirt, jeans, and bomber jacket kinda guy due to tropical-weather constraints), I would still happily wear the Nuage on laid-back weekends, paired with matching sneakers and shorts. One does not need to possess a level of confidence such as that of Gianni Agnelli (the elderly Italian gentleman whom was the principle shareholder of Fiat, whom also wears a watch over the cuff of his shirt) to wear a watch like the Nuage; all one needs is an appreciation for the finer things in life. And if one considers themselves a watch enthusiast, the odds are high that they would fulfil that criterion anyway. Wrapping up, the Nuage is by far my favourite watch from MJW so far. Considering how much I enjoy their designs, that is not a statement I make lightly. The Nuage brings to the table a carefully crafted watch of elegance and uniqueness. As is the case with most of MJW’s creations, you are given the opportunity to wear fine art on your wrist for a relatively small amount of money. Thank you MJW for this opportunity, till next time! I would also like to extend a very warm thank you to the lovely Maxine for participating in our photo shoot for the Nuage. Next#OpenLetter – KC and Vincent Joins Team Matick!